We are Certified and Licensed Master Electricians and take pride in offering you prompt, high quality, professional service. We are members of the Electrical Contractors Association of New Zealand and Site Safe New Zealand, with a considerable Public Liability insurance. We provide $10,000.00 ECANZ workmanship warranty on all our work. We have worked carefully to formulate a rate structure that provides you with quality, professional electrical services at a competitive price. We use an advanced booking system which allows us to delegate time allocations with ease. Our team are efficient and aim to complete your project in a diligent manner, saving you time and money! Customer satisfaction is our priority. 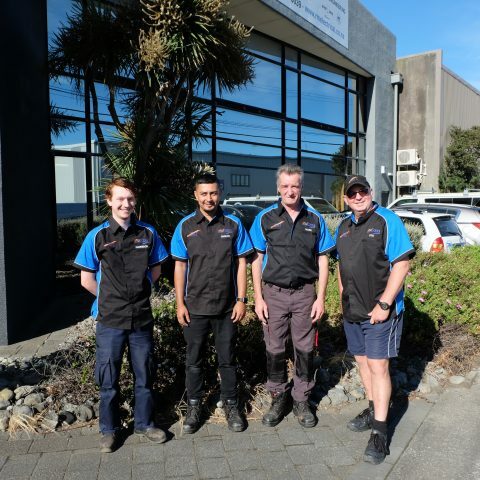 Our large, modern workshop and service center is located in the heart of the Petone industrial area with staff ready to take calls and delegate jobs to our team with an estimated response time of 2 hours. We have dedicated office staff who are readily available to answer any queries you may have. Electrotech 2011 Limited owned and operated by husband and wife team Harpreet and Ranjini Singh, bought Key Electrical from Greg Barton in 2016 with the aim to establish a focus on customer satisfaction and to expand the range of services offered. Harpreet has over 35 years’ experience in the electrical industry and Ranjini has 27 years’ experience in the finance and business sectors, making them well equipped to lead our dedicated team towards providing successful outcomes for customers. Our large, modern workshop/service centre is located in the heart of the Petone industrial area with staff ready to take calls and allocate jobs to our team with an estimated response time of 2 hours. We operate 24 hours a day, 7 days a week for your convenience, and offer our services nationwide. Our team consists of highly dedicated, qualified and experienced staff in all aspects of residential/commercial electrical inspection, installation, servicing and maintenance requirements for our client’s property and appliances. We carryout electrical data and networking installations nationwide not only to our large residential customers but also to our large loyal commercial clients as well. Our clients rely on us to operate to the highest level of health and safety, professionalism and trust that we will use high quality New Zealand compliant products every time. What areas in New Zealand do you service? We are a 24/7 operation and our after hours service is operated through call centre which takes calls and allocates work to our team. Areas that we cover include and is not limited to – from Wellington City and its suburbs, Hutt Valley, Upper Hutt, Masterton, Kapiti Coast to Levin. We also are available to service all other areas in New Zealand and have staff operating nationwide. What can you offer my business? We can provide wiring for new offices, shops and factories, all lighting requirements, including neon-signage lighting, floodlighting and security lighting, location and servicing of electrical faults, additional power points or lighting controls, switchboards, RCDs, check meters, energy audits and efficiency improvements, computer and telephone cabling, commercial appliance installation and servicing, ATM installation and general electrical maintenance. Is Key Electrical part of Site Safe New Zealand? We are proud to be members of Electrical Contractors Association of New Zealand and Site Safe New Zealand, with a Public Liability of $10 million and a comprehensive Health and Safety system in place.